Claim #1: Companies do not have an economic incentive to promote sustainable water-related conditions beyond their fence-lines (apart from public relations gains). If many companies’ bottom lines are negatively affected by unsustainable watershed conditions, then it follows that they have an economic incentive to improve those conditions when they can. Claim #2: Companies have an interest in weak water-related governance, which allows them to continue socially and environmentally harmful, yet profitable, practices; consequently, companies strive to undermine democratic processes. First, yes, companies can be negatively affected by strict regulations that limit their activities and thus they often consider such regulations a business risk. No one would deny this. However, water-intensive companies are also negatively affected by a LACK of regulation on other actors in their watershed—a lack that eventually leads to the depletion or degradation of a shared resource. This creates a not uncommon scenario in which a wide range of actors using a common pool resource are threatened both by the possibility of their own resource use being regulated and by the unregulated resource use of others. Indeed, 54% of companies responding to CDP in 2012 consider “regulatory uncertainty” a risk (CDP 2012). Think about it. If you are a water-reliant company that shares its finite, stressed water source with hundreds of other users, do you have an interest in an effective management of that source? Companies have a very strong interest in ensuring water sources are soundly managed over the long term so that they can continue maintaining their production. Claim #3: Water challenges are not “shared”; many issues that companies consider risks, namely regulation, are actually a boon to communities and ecosystems. The belief that companies have an incentive to invest in sustainable water management beyond their fence-line is grounded in what has been referred to as “shared risk.” Some have questioned the appropriateness of this term, knowing that companies, communities, and others all experience risk uniquely and that water risks are often distributed unevenly. The water risks that a company faces are not equal or comparable to those of a community that doesn’t have access to drinking water. That is true. However, the overarching concept that companies have a shared interest with the public for reliable water services and sustainable water management is gaining traction (Hepworth 2012, Newborne and Mason 2012). In Colombia, in the mountainous upland ecosystems near Bogota, sedimentation has severely degraded water quality in the area, raising treatment costs for the local water utility, residential users, and businesses, such as SABMiller’s Bavaria, alike. In Kenya, Lake Naivasha has experienced declines in water supply and quality due to a variety of causes. The multiple water challenges created risks for all water users who rely on healthy ecosystems and water resources for their livelihoods and future (ERD 2012). While “risks” may not be shared per se, the concept of shared interest elevates local water challenges as shared problems—ones that can be addressed in proactive and collaborative ways. Critiques against corporate engagement in water issues, knowingly or not, appear to advocate that stakeholders facing similar water challenges need not (or should not) speak to or engage with one another over shared resources, leaving them to fight and compete over those resources. Perhaps most importantly, companies can make a significant contribution to sustainable water management. They can provide sorely needed financial resources to address water losses, especially in places where water governance is weak and capital is limited. They can help introduce new technology to improve water-use efficiency and water quality and collection of water-related data. They can even use their significant influence and resources to advocate for more sustainable government water policies. So, if companies have the ability to contribute to sustainable water management and the business interest to do so, shouldn’t the conversation be about how we can ensure their efforts are transparent and equitable and how we can hold them accountable, rather than how we can exclude them from the conversation? Carbon Disclosure Project. 2012. Collective Responses to Rising Water Challenges. CDP Global Water Report 2012. Authored by Deloitte. https://cdproject.net/CDPResults/CDP-Water-Disclosure-Global-Report-2012.pdf (accessed March 26, 2013). ERD. 2012. Confronting Scarcity: Managing Water, Energy and Land for Inclusive and Sustainable Growth. European Report on Development, Brussels. http://erd-report.eu/erd/report_2011/documents/erd_report%202011_en_lowdef.pdf (accessed March 27, 2012). Hall, D., and Lobina, E. 2012. Conflicts, Companies, Human Rights and Water—A Critical Review of Local Corporate Practices and Global Corporate Initiatives. University of Greenwich. Public Services International Research Unit. http://psiru.org/reports/conflicts-companies-human-rights-and-water-critical-review-local-corporate-practices-and-glo (accessed March 26, 2013). Hepworth, N. 2012. Open for Business or Opening Pandora’s Box? A Constructive Critique of Corporate Engagement in Water Policy: An Introduction. Water Alternatives 5(3): 543-562. http://water-alternatives.org/index.php/tp1-2/1881-vol5/224-issue5-3 (accessed February 21, 2014). India Resource Center. 2010. Coca-Cola Liable for US$48 Million for Damages—Government Committee. http://indiaresource.org/news/2010/1003.html (accessed March 26, 2013). Larson, W.M., Freedman, P.L., Passinsky, V., Grubb, E., and Adriaens, P. 2012. Mitigating Corporate Water Risk: Financial Market Tools and Supply Management. Water Alternatives 5(3): 582–603. http://limno.com/pdfs/2012_Larson_WatAlt_Art5-3-5%5B1%5D.pdf (accessed February 21, 2014). Morrison, J., Schulte, P., Christian-Smith, J., Orr, S., Hepworth, N., and Pegram, G. 2010. Guide to Responsible Business Engagement with Water Policy. CEO Water Mandate. 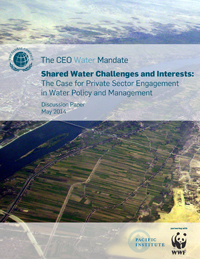 http://unglobalcompact.org/docs/issues_doc/Environment/ceo_water_mandate/Guide_Responsible_Business_Engagement_Water_Policy.pdf (accessed February 16, 2011). Newborne, P., and Mason, N. 2012. The Private Sector’s Contribution to Water Management: Clarifying Companies’ Roles and Responsibilities. Water Alternatives 5(3): 604–619. http://water-alternatives.org/index.php?option=com_content&task=view&id=224&Itemid=1 (accessed March 26, 2013). Pegram, G., Orr, S., and Williams, C. 2009. Investigating Shared Risk in Water: Corporate Engagement with the Public Policy Process. WWF. Authored by Pegasys Consulting. http://assets.wwf.org.uk/downloads/investigating_shared_risk.pdf (accessed March 26, 2013). CDP (Carbon Disclosure Project) is an NGO based in the United Kingdom that leverages market forces such as investors, customers, and governments to incentivize companies and cities across the world to measure and disclose information on their environmental and sustainability performance, including that related to water management.